Аt the beginning of 2017 along with the announcement of our new corporate identity and CREW approach, we also introduced our innovative solution, which enabled our customers to monitor deliveries in real-time directly from their mobile devices. In logistics we use the term “last mile”, to describe the final leg of the delivery process, in particular – shipment’s movement from a supplier to the end customer. The last mile is the most vulnerable link in the supply chain as there are many challenges that may come up due to the lack of information and transparency. The visibility of the last mile brings various benefits, from which our customers can take advantage of in order to plan their time and to be assured, that their shipment will be delivered in a timeframe, suitable for them. Real-time visibility. Where is my shipment? Every shipment moved either by road, ocean or air, with pick up or delivery within Bulgaria can be monitored in real-time via customer’s mobile phone. Plan receipt of goods. When can I expect my shipment? 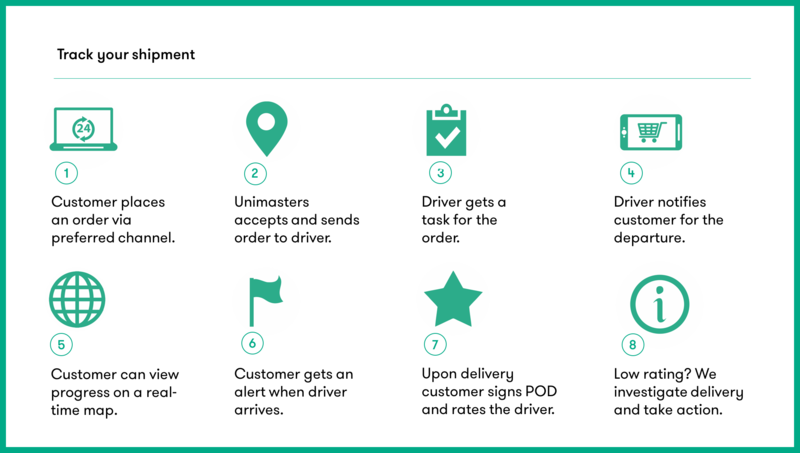 Full visibility of couriers movement to delivery/pick up address via mobile app, with information about driver’s arrival time. The service includes smart notifications sent via e-mail or sms. Courier identity. How will deliver my shipment? Via the mobile app customers are informed about the name and the identity of the driver, who will deliver/pick up the shipment.